I wore this lace dress for Christmas last year (this is how I styled it). It was a gift from my bff. I dressed it down a bit this time around, but still kept it festive. I think I could probably get away with wearing it two years in a row which saves me $$$$! The boots were a gift from my cousin (this year). She updated my old, torn up, steven wedge boots...the ones I didn't want to part ways with, but I'm extremely happy and grateful for my new pair! Hope you like this outfit! Have a wonderful last weekend before Christmas weekend:)! ooh i really love this!!! your layering is always so great! $50 TJMAXX Giveaway on the blog! This is a really great look! Love how you re-styled the dress! SO chic! Thank you so much Tiffany:)! Really appreciate it:)! What a versatile dress! Those are the best kind! Love how you put the turtlneck underneath. Cute! Thanks darlin! Exactly, I love a good neutral dress that I can style in many different ways! The turtleneck peek a boo! I love it! Looks amazing! Thank so much love ;))! Don't you love the dress too;))! This outfit is my favorite!! You look so sharp! Thanks so much girl! Have a wonderful weekend:)! I LOVE this outfit, one of my favorites! The layering is just fabulous and the dress is so cute! Thank you so much my friend:)! Agree with you completely:))! Thank you so much darlin! Happy Holidays:))! loll thank you so much:)! Your necklace is great and your hairstyle . I love all the layering you did with the dress and the chunky statement necklace! Also, I'm jealous of your boots! I've been debating whether or not to get it! It looks so cute the way you're wearing it. Thank you so much girl! You should definitely get them...maybe they'll go on sale after the holidays?! I wore out my first pair. You can wear them with just about anything. They're not really trendy...so you don't have to worry about them going out of style. I think it's a classic staple piece that belongs in your closet:)! Verry nice outfit!I love your dress! lovely boots. I really like the color. I have a pair of boots that I just cant let go of too. Thank you for stopping by. Of course I would love to follow each other. I am following you. Thank you Inna! It's freezing outside..oh my dear :O! Thank you so much Sheila:)! Happy holidays to you and your loved ones! About your look today is really lovely, I love this soft colours and the mix of clothing you did. You look great in this post. Great dress... so fun to see how you styled it two different ways! Love the Intyce boots. Have a great weekend! Hey! Thank you so much for stopping by my blog! And thanks for following too! im following you too on gfc! I love your blog! I love your outfit. The layering is beautiful. I love this time of year it is perfect for beautiful layers. I really love your dress and boots! so pretty! 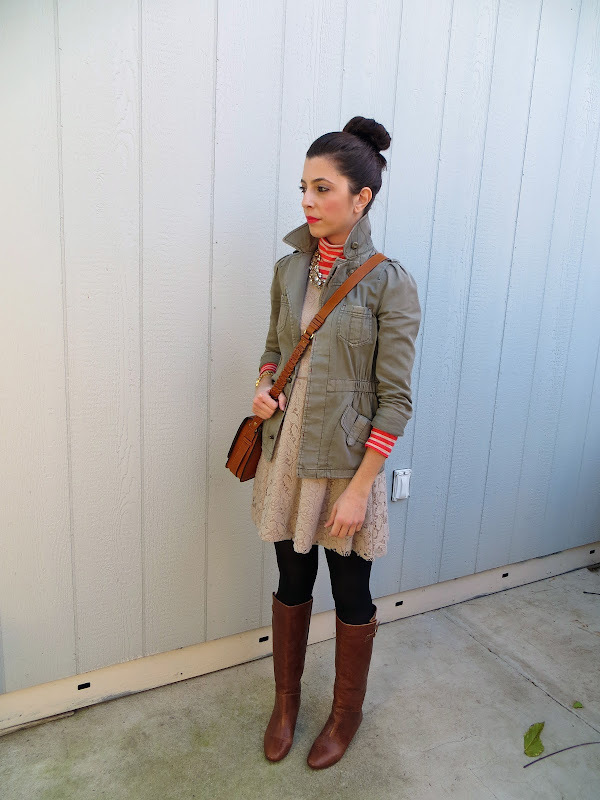 Oh my word, I'm absolutely obsessed with this look (in fact, I'm pinning it right after i comment)! Amazing layering and color pairings... Seriously great styling! This outfit is so cute! I love the layering and that gorgeous necklace!! great look honey,your dress is totally cute! I really like your look, casual yet chic. I think the necklace just adds enough to make it special! Love this look; so fresh and classy! thank you! :) following, follow me back? Definitely will follow you back! Thanks darlin:)! I like your dress and your boots! I follow you back, see you soon! Hey! Oh my God I love your blog! Thank you so much for stopping by and leaving me a comment! ♥ I followed you back dear and I liked you Facebook page! Also this outfit is amazing! You look so beautiful! It never occurred to me to wear a dress with a turtleneck! You styled the whole outfit so well! It's really inspiring! Thank you so much darlin!! Thank you so much! Merry Christmas to you too:)! I love this entire outfit, looks so cosy! What a beautiful blog you have too! your look is amazing and i really love the necklace! I really love the spin you took on this dress. It's fun and diferent! I absolutely adore it! I am now subscribed to this lovely blog, Merry Christmas! Thank you so much Alexis! I will definitely check out your blog:)! No problem darlin! Maybe it's set to following privately? I would love to follow each other! I am now following you! Love those knee high boots and merry xmas! Thank you so much :))! Thank you so much darlin! Merry Christmas:))! Thank you so so much darlin! Happy Holidays:))! Why do women want a bun on their head when they look attractive letting their hair down? It's easier to put your hair in a bun....and I personally love it, but you're entitled to your own opinion:)! Thank you so much darlin! Merry Christmas:)! Will definitely visit your blog soon! Just dropping by to wish you Merry Christmas! Thank you so much ladies! Merry Christmas to you too:)! Thank you so much darlin! I agree with you about it being more crisp! Really appreciate your feedback:))! you are gorgeous! love your boots. I am loving this look very much and all the pairing to posted on Fluerani's blog.. super hip and cute! I am a new follower and would appreciate it if you could sometime drop by my tiny blog and follow IF you like! Thank you so much darlin! Really appreciate it:)! Pretty dress! And also love the necklace! Thanks Melinda:))! I sure did! Have a very happy, healthy, and prosperous New Year my friend! I know 2013 will be filled with many blessings for you:)! Good things happen to good people:)! I love how you layered this.